We've mentioned the massive proposal for restructuring how research is administered at the University of Wisconsin – Madison (and Sifting and Winnowing remains the go-to site, but see here too). This would disconnect research admin from grad education and put the former under the provost's control A dramatic change to one of the most successful research operations in the country, and arguably the world, in higher ed. If readers from UW have visited one of the town hall forums with the provost, you may have been struck, like so many of us, by the vague justifications and lack of examples at every turn. The question of exactly what problem this move would solve has gotten no real answer. Normally, when something like this comes down, there's a detailed report laying out the issues with plenty of examples and arguing clearly for the new structure. In this case, there seems to be literally nothing. We can gripe about 'another taskforce' or 'one more committee', but the failure to prepare a careful and explicit case for this reorganization is just stunning. And this shoot-now, ask-later approach has shaken the confidence of many faculty and staff. The Graduate School here runs graduate education, and the Provost (or to be exact, the Vice-provosts) looks after research administration. It works well here, but UW is quite a bit bigger than Yale and my impression is that the Dean of the Graduate School and the Vice-Provosts work pretty closely for the higher-level stuff. Splitting them is not necessarily cause for despair, although I say that not knowing anything about the particulars of the situation and if they can't provide a cogent reason for why they're reorganising that's a bit worrying - especially if they can't even provide theoretical reasons why restructuring might be a good idea. Thanks. Much of the concern here is about process, or rather the absence of process. 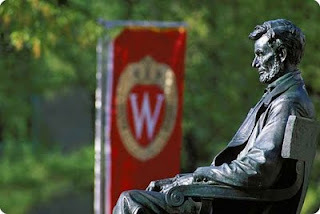 Wisconsin faculty have by law a central role in running the university and we seem to be getting cut out here.